I am always looking for new ways to cook with and prepare one of my all-time favorite vegetables, butternut squash. One of the best cooking methods (and easiest!) to prepare it is roasting. The roasting process really brings out the sweet flavor and it also caramelizes it slightly while making the edges a bit crisp! Because roasting happens at such a high temperature, roughly 425-450 degrees, it allows the cubes of squash to cook on the outside and still retain an “al dente” like texture inside, almost the consistency of a cubed potato you would find in soup. While roasted butternut squash is fabulous by itself (right out of the oven), on salads, sandwiches, and in my Autumnal Risotto, I really wanted to showcase the delicious flavor in an all-time classic like lasagna! 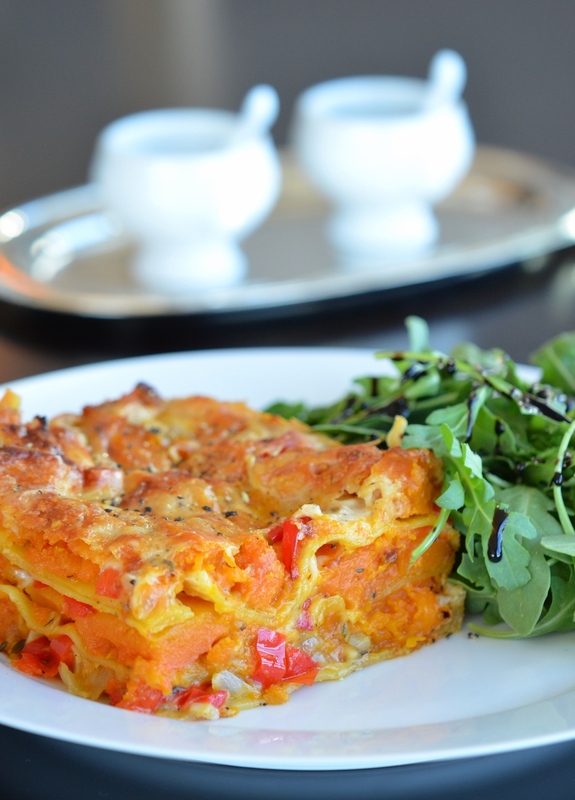 My Roasted Butternut Squash Lasagna is filled with other favorites like red peppers, fresh thyme, and the nutty flavor of Gruyere. Don’t let the size of the pan fool you either! This lasagna is as hearty as they come, layer after layer, bite by bite, it’s going to be a fabulous roller coater of flavor. Tie up those apron strings, pour a glass of wine, and get cookin! Happy yummy-ness! Preheat the oven to 375 degrees F. Butter a 8 x 8 x 2-inch baking dish. In a large sauté pan heat 4 tablespoons of butter and 1 tablespoon of olive oil over medium-low heat. Cook the onions and red peppers for 15 to 17 minutes or until tender and the edges are slightly golden brown. Add the garlic, thyme, and roasted butternut squash. Continue to cook for another 2 to 3 minutes. Remove from the heat and set aside. Combine all three cheeses into a small bowl and set aside. In a small sauce pan bring the milk to a simmer and then set aside. In a large sauce pan melt 8 tablespoons (1 stick) of butter over low heat. Add the flour and continue to cook for another 1 to 2 minutes, stirring constantly with a wooden spoon. Pour the hot milk over the butter mixture. Add the salt, pepper, and nutmeg. Continue to cook for another 5 to 6 minutes until it becomes thick, stirring constantly with a whisk. To assemble the lasagna, coat the bottom of the baking dish moderately with white sauce. Arrange a layer of noodles to cover the bottom of the dish. Add 1/₃ of the sauce, 1/₃ of the butternut squash mixture, and 1/₃ of the cheeses. Repeat the process twice more. You will have a total of three layers of noodles with three layers butternut squash and cheese in-between. Place the baking dish onto a sheet pan and bake for 40-45 minutes, or until the top is browned and the sauce is bubbly and hot. Allow to cool for 10 minutes and serve hot. Tip: The lasagna may be assembled 1 day in advance and kept in the refrigerator. Allow the lasagna to sit out at room temperature for 1 hour before following baking instruction. In a large bowl toss the cubed squash with the olive oil, salt, and pepper. Place squash on a baking sheet and bake at 400 degrees F for 40 to 45 minutes. Halfway through the baking time, toss the squash pieces with a spatula to ensure even roasting and browning. Remove from oven and let cool. The squash should be aromatic and lightly caramelized. Tip: The roasted butternut squash can then be stored in the refrigerator for up to 5 days.